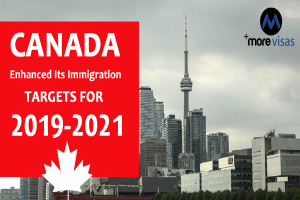 Canada is expanding its immigration objectives for 2019 and 2020 and will increase its plan of multi-year immigration levels by 2021, setting the stage for the entry of 1.3 million current permanent residents within 2018 and 2021. The changes were declared as part of I.R.C.C's 2017 report to Parliament that was made public Oct 31. The announcement coincides with the first anniversary of I.R.C.C’s primary plan of multi-year levels, which was begun to guide Canadian immigration plan from 2018 to 2020. Rising targets and prolonging the plan by another year jobs Canada to now welcome higher than 1.3 million immigrants by the country’s different immigration categories which are economic, humanitarian and family and refugee within 2018 and 2021, depends on its yearly targets. The current 2019-2021 proposal calls for steadily increasing admissions objectives every year up to 350,000 in 2021. The aims for 2019 and 2020, initially set at 330,000 and 340,000, individually, have now been risen to 330,800 and 341,000. The economic migration programs operated by the economic system of federal Express Entry and Provincial Nominee Programs of Canada will remain to play significant roles below the plan, which extends the potential admissions number by each program in 2019. Canada is planning for welcoming 1.3 million permanent residents by the end of 2021, nearly a one fourth — 331,000 — are proposed to come by the three economic immigration classes conducted by Express Entry, depends on their yearly targets. PNPs, meantime, have a mixed target of 255,100 over the 04 years, which accounts for approximately 19% of the 1.3 million cumulative admissions over that period. These programs enable participating provinces of Canada and territories to specify a set of immigration number applicants for permanent residence every year depends on local labor market requirements.